下载 下载 How to make a Gantt Chart Spreadsheet in Excel? this example Gantt Chart Excel spreadsheet template now! How to make a Gantt Chart Spreadsheet in Excel? An easy way to create your spreadsheet is by downloading this example Gantt Chart Excel spreadsheet template now! 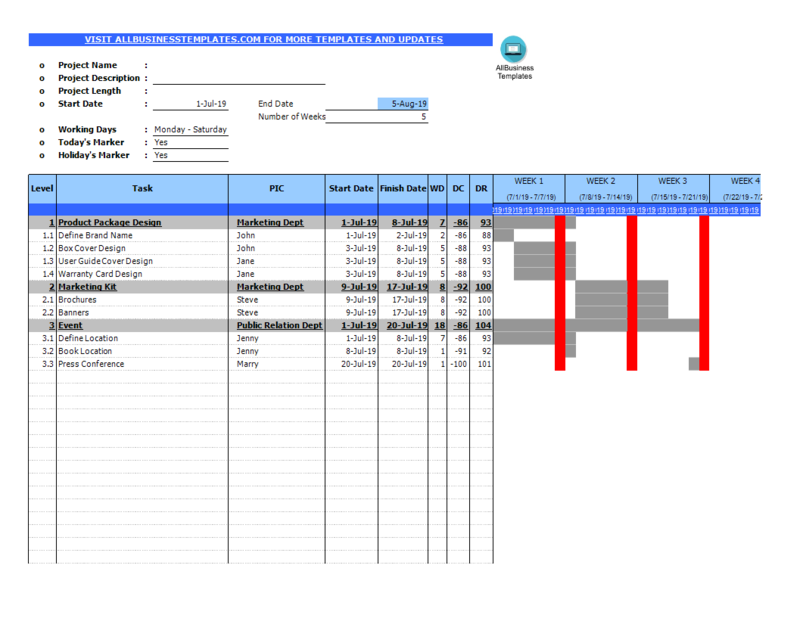 The Gantt chart is one of the most popular scheduling tools in project management. It’s a horizontal bar chart that shows progress on a project schedule. Tasks are arrayed on the vertical axis while the horizontal axis represents time. Tasks may be rolled up into summary elements, which constitutes a number of subtasks and represents a phase of project work. What are the Key Benefits of Using a Gantt Chart? Promote detailed planning. Simply listing tasks forces project managers to break work down into chunks and understanding task dependencies requires granular knowledge of how a project is meant to proceed. Pinning down expected completion dates lead project teams to think carefully about resource requirements. Help to visualize the project schedule. A project’s critical path is the longest continuous sequence of tasks that effectively determines the duration of a project. Surface potential resource risks. On a technical level, Gantt charts help avoid resource overload, provide a basis for schedule accountability, and help identify where cost and duration can be reduced. Further, these charts can help identify potential problems such as if resources have been double-assigned, where staff are overscheduled, and when delays might affect the critical path. Improve project communications. On a human level, Gantt charts simplify the process of communicating the project plan and help keep everyone on the same page with little effort. They make the project’s planned progress easy for team members to visualize, providing both clarity and motivation to meet deadlines. Our Excel templates are grid-based files designed to organize information and perform calculations with scalable entries. Beginners and professionals from all over the world are now using spreadsheets to create tables, calculations, comparisons, overviews, etc for any personal or business need. This Excel template is a great way to increase your productivity and performance. It gives you access to do remarkable new things with Excel, even if you only have a basic understanding of working with formula’s and spreadsheets. If time or quality is of the essence, this ready-made presentation can certainly help you out! Download this Gantt Chart Excel spreadsheet now!